The serpent is one of the oldest mythological symbols representing good and evil, wisdom, life and eternity, and it may be seen on everything from ancient religious artifacts to the caduceus, the symbol of modern medicine. 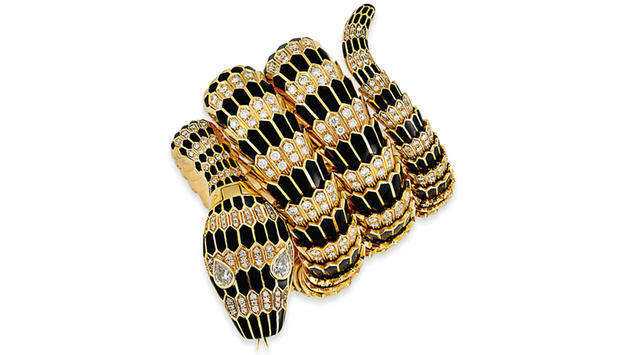 Bulgari began producing snake-inspired bracelets in the late 1940s, and the design immediately took hold, laying the groundwork for the ensuing decades’ serpent-inspired watch designs. 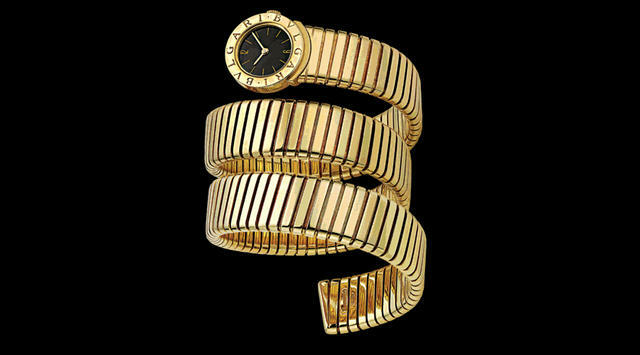 In the 1960s, a variety of Tubogas-style Serpenti watches were introduced in yellow gold, white gold or a combination, and various enamel examples were also offered, many with diamond and other gemstone accents. Also during this era, a specially made Serpenti adorned the wrist of Elizabeth Taylor on the set of “Cleopatra,” further drawing attention to this icon-in-the-making and no doubt enhancing its already-wide appeal. These snake bracelets and watches required a high degree of craftsmanship. Focused attention was paid to authentic detail, and certain species of snakes inspired certain bracelet colorations. The reptiles’ names were even subtly engraved in Italian on the tails in a touch of whimsy. Other enamel snakes were inspired by fashion rather than nature: sunny yellow snakes shone with red scales while white scales glittered against bright turquoise. The gold pentagon-shaped scales were individually enameled then fired before being painstakingly assembled with tiny screws. Interestingly, Bulgari partnered with Jaeger-LeCoultre and Vacheron Constantin to create movements for snake timepieces, and these Swiss brands continued creating watches with Bulgari into the early 1970s, with most of the watches possessing dual signatures. 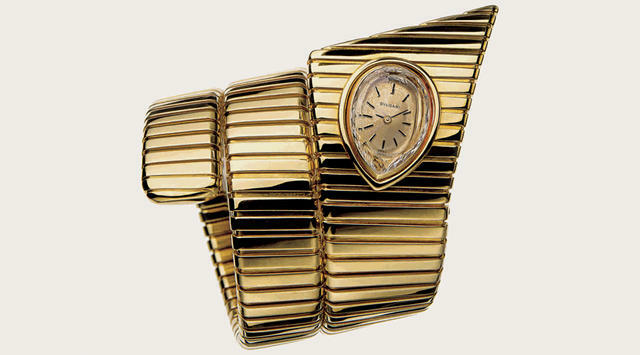 An octagon-shaped watchcase made by Vacheron Constantin is seen on several Bulgari Tubogas snake watches of that era, but by 1978, due to the opening of a manufacturing facility in Switzerland called Bulgari Time, Write & Light, the Tubogas watch bracelets featured Bulgari-made watches exclusively. In the 1980s, the taste for luxury goods was on the upswing and brand logos became the rage. 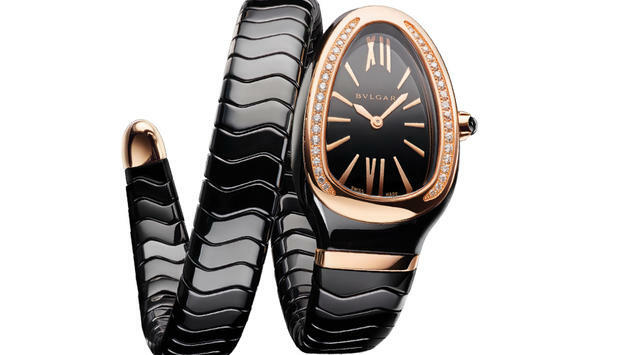 Thus the Bulgari-Bulgari watch paired with a Tubogas serpent-style bracelet became popular and in fact was so successful, that it was continuously produced for almost thirty years. Renditions from the 1980s include yellow and white gold models, while the 1990s saw a steel version for the first time. In 2014, coinciding with the year of Bulgari’s 130th anniversary, a rare Bulgari Serpenti watch from 1965 set a new world record at Christie’s. This extraordinary piece, which surpassed the estimate of between $300,780 and $417,750, reached a final hammer price of $1,107,038. A rare Bulgari Serpenti watch from 1965 set a new world auction record at Christie’s. 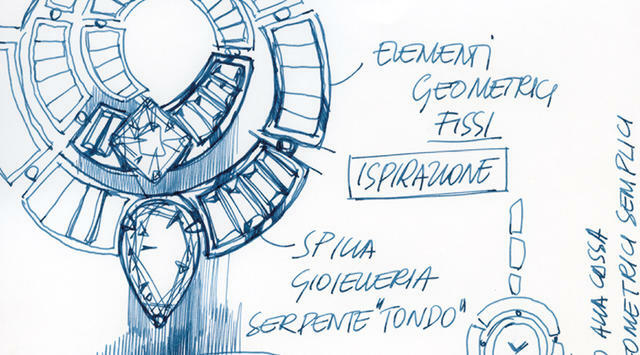 The Serpenti continues to reinvent itself with each passing decade, and this year’s Baselworld debuted an entirely new design: the Serpenti Incantata, wherein the snake wraps itself around the watch dial. Each part of the iconic snake’s head and body was redesigned, creating a wholly new and contemporary look. 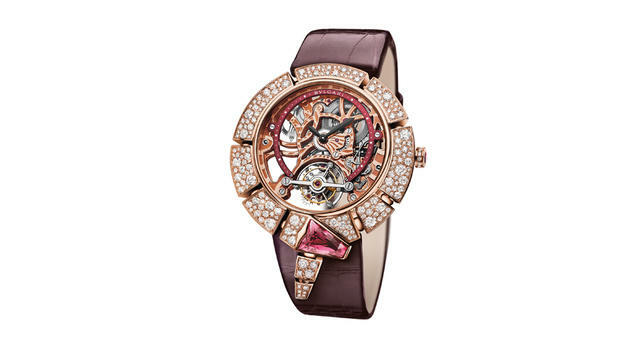 The Serpenti Incantata (“Enchanted Snake”) comes in a variety of styles and sizes, including a Skeleton Tourbillon model with a mechanical movement (BVL caliber 208) that perfectly marries Bulgari’s high jewelry expertise with haute horlogerie. The new Serpenti Spiga, which Bulgari describes as “boldly rock’n’roll,” is a new iteration of the Tubogas-style Serpenti, this time crafted in black or white high-tech ceramic. The diamond-set gold bezel and the tip of the tail, also in gold, are elegant reminders of Bulgari’s roots in jewelry. So, too, the new Serpenti Jewellery, which comes in combinations of metals or with diamonds, colored mother-of-pearl, turquoise and other precious gems. The Serpenti Five-Coil Tubogas is a dramatic take on the well-loved snake with its curved 35mm steel case, 18-karat pink gold bezel set with diamonds, a black opaline dial, and multiple coils in 18-karat pink gold and steel. The future no doubt holds new and exciting takes on the famous Bulgari Serpenti, proving that good design, abiding symbolism and a willingness to evolve are winning ingredients for timeless appeal.